NOTIFICATION: Uttar Pradesh Rajya Vidyut Utpadan Nigam Limited (UPRVUNL), Lucknow inviting online applications for filling up 117 vacant posts of Junior Engineer (Trainee), Chemist Grade II, Assistant Accountant and Office Assistant -III (Accounts) from eligible and interested willing candidates. It is latest & good information for unemployed personnel those who are looking for these new Jobs in Government sector & other organizations. Job seekers, who wish to apply for these vacancies regarding UPRVUNL Recruitment 2019, must have passed Bachelor Degree in Commerce/M.Sc in Chemistry/Civil Engineering Diploma/Typing Knowledge with a required experience if asked. Applicant’s upper age should be as per Govt. rules and age relaxation is applicable to all reserved category candidates i.e.SC/ST/OBC/PWH/Ex Servicemen /Women candidates etc. आंध्र प्रदेश लोक सेवा आयोग ने 677 पदों Forest Section Officers, Forest Beat Officer (FBO) and Assistant Beat Officer (ABO), Hostel Welfare Officers, Deputy Surveyor, Town Planning & Building Overseer, Food Safety Officer (FSO), Zilla Sainik Welfare Officers, Royalty Inspector and various Assistant, Technical Assistant, Deputy Inspector and Welfare Organiser की भर्ती के लिए एक अधिसूचना जारी की है। इच्छुक उम्मीदवार यहाँ आवेदन कर सकते हैं। आवेदन करने से पहले पूर्ण अधिसूचना यहाँ पढ़ें। 677 vacant posts of Forest Section Officers, Forest Beat Officer (FBO) and Assistant Beat Officer (ABO), Hostel Welfare Officers, Deputy Surveyor, Town Planning & Building Overseer, Food Safety Officer (FSO), Zilla Sainik Welfare Officers, Royalty Inspector and various Assistant, Technical Assistant, Deputy Inspector and Welfare Organiser through Andhra Pradesh Public Service Commission (APPSC), Vijaywada. Last Date to Apply: 13-03-2019/20-03-2019/27-03-2019/28-03-2019/16-04-2019/17-04-2019. PLACE OF POSTING: Uttar Pradesh. 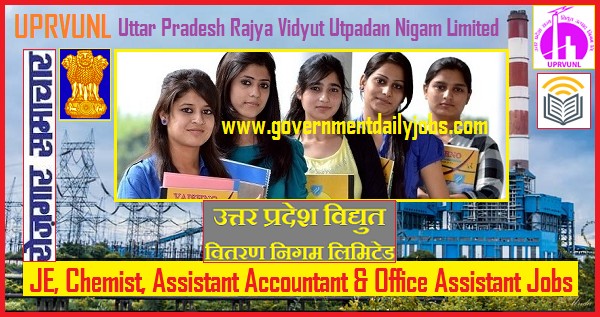 NO OF POSTS: 117 vacant posts of Junior Engineer (Trainee), Chemist Grade II, Assistant Accountant and Office Assistant -III (Accounts) in Uttar Pradesh Rajya Vidyut Utpadan Nigam Limited (UPRVUNL), Lucknow. 1. Junior Engineer (Trainee): 47 posts. 3. Assistant Accountant: 26 posts. 4. Office Assistant: 17 posts. 1. Junior Engineer (Civil): A passed of 3 years Diploma in Civil Engineering from any recognized Institute with adequate knowledge of Hindi language. 2. Chemist (Grade II): A passed of M.Sc Degree in Chemistry from any University of established by Law in UP. 3. Assistant Accountant: A passed of Bachelor Degree in Commerce form any recognized University. 4. Officer Assistant (Grade III): A passed of Bachelor Degree in Commerce form any recognized University with minimum Typing Speed 30/40 wpm Hindi/ English. 1. Junior Engineer - 18 to 40 years. 2. Other Posts - 21 to 40 years. 1. Junior Engineer – Rs.44,900/-. 3. Assistant Accountant – Rs.29,800/-. 4. Office Assistant – Rs.27,200/-. REQUIRED APPLICATION FEE: For said vacancy a non- refundable application fee is to be paid by the candidates as per rules. An amount of Rs. 1000/- by General & OBC candidates, Rs. 700/- by SC/ ST candidates of Uttar Pradesh and Rs. 10/- by PWD candidates to be paid through using net banking or by using visa/master credit/debit card or SBI Challan up to 24-03-2019. Examination Centre: Lucknow, Allahabad, Kanpur, Varanasi, Gorakhpur, Meerut, Agra, Ghaziabad, Noida, and Greater Noida. HOW TO APPLY: For said posts (UPRVUNL Recruitment 2019 of 117 JE, Chemist, Assistant Accountant & Office Assistant Jobs Jobs Apply online) eligible, willing and interested candidates may apply through online at official website up to last date. Applicants must retain a hard copy for future reference. 2. The homepage of the official portal will display on the screen. 3. On the homepage, search for the related link “UPRVUNL Recruitment 2019 for Junior Engineer/Chemist/Asst Accountant & Office Asst Posts“. 4. Read the details mentioned in the official UPRVUNL Recruitment 2019 Notification Pdf. 5. Ensure the eligibility for UPRVUNL Jobs 2019. 6. If eligible, then click on “UPRVUNL Recruitment 2019 Apply Online” tab. 7. Fill the required & mandatory details in UPRVUNL Application Form 2019. 8. Pay the required amount of application fee. 9. Upload the scanned copies of the photo & signature in the prescribed format. 10. Cross verify all the details once before submission of UPRVUNL JE Online Form 2019. 11. Finally, keep the hard copy of UPRVUNL JE Trainee Application Form 2019 for future reference. CONTACT ADDRESS: Uttar Pradesh Rajya Vidyut Utpadan Nigam Limited (UPRVUNL), Room No. 1025, 10th Floor, Shakti Bhavan Vistaar, 14 -Ashok Marg, Lucknow -226001. CONCLUSION: Uttar Pradesh Rajya Vidyut Utpadan Nigam Limited (UPRVUNL), Lucknow invites online application for the recruitment of 117 vacant posts of Junior Engineer (Trainee), Chemist Grade II, Assistant Accountant and Office Assistant -III (Accounts) on regular basis from Indian residents who are eligible & interested; candidates can apply through online application. LAST DATE TO APPLY: 21-03-2019 for UPRVUNL Recruitment 2019- Apply 117 Junior Engineer & Others Posts.